What can signify “Made in México” better than a piñata? How about canvases “painted” with papel piñata, that colorful, decorative fringed paper that wriggles whenever the piñata gets struck. 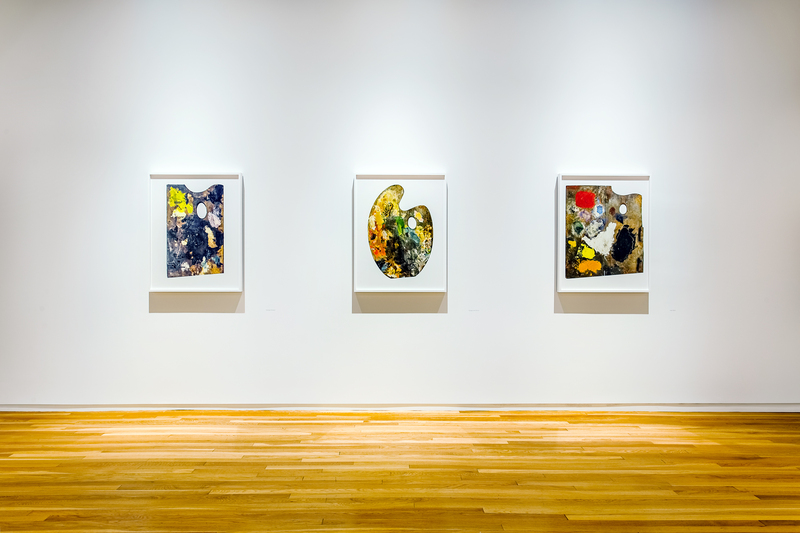 This unique medium in the exhibition by artist Justin Favela is showing at the Philip and Muriel Berman Museum of Art at Ursinus College in Collegeville through December 19. 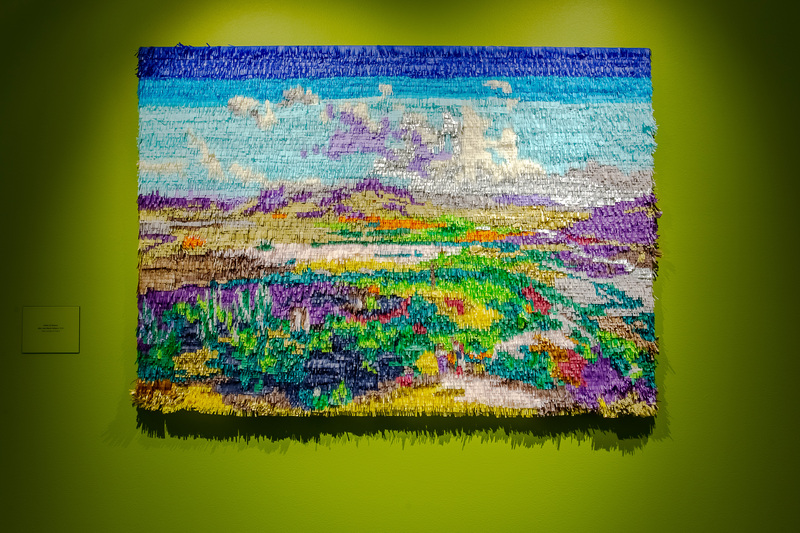 On the lower level of the Berman Museum is an enormous installation entitled “Valley of Oaxaca.” A mural created out of piñata paper that winds around the floor’s entire wall and fills the ceiling was created with the help of art students over several months. Favela’s technique was to sketch out the image, assign a color to the various sketched areas and, with the help of student volunteers, cut thousands of fringes on reams of colored tissue paper to use in place of paint. Once glued into place, the piñata paper has become a mural of the Valley of Oaxaca. Impressive both in scale and representation of the varied landscape of the beautiful southern Mexican state of Oaxaca, you don’t want to miss it! The impression upon entering Favela’s upper gallery show, “Re/Presenting México: José Velasco and the Politics of Paper” is of bright colors shimmering – like water floating on an oil slick. At first glance there is nothing but colors, a feel of Mexican street vendors offering huipiles and ponchos and handmade jewelry, hand tooled leather belts and wallets, flouncy skirts and hand embroidered blouses. Each canvas has a bustling liveliness like being in a crowded Mexican market. It isn’t until you step back and concentrate that an actual image can come into focus. Although I tend to ignore the labels next to each art work in a museum, preferring to discern meaning of my own in the piece, Favela’s smaller works required me to read what the artist is asking me to see. Clearly the inspiration for Favela’s work is the 19th century Mexican landscape artist José Velasco’s oil paintings, but his success in recreating the same image is limited by his medium – the piñata paper. Helpfully the Museum has provided a monograph of Velasco’s works on a table in the gallery in which are large glossy photos of each oil painting being refashioned by Favela out of piñata paper. However, if, as has been said, “the medium is the message,” then at least the ambiance of México comes through loud and clear. On the ground level gallery of the Berman Museum is a fascinating exhibition, Das Meisterstük [The Masterpiece] also on view through December 19. Photographer Matthias Schaller has made a career of documenting the paint palettes actually used by over seventy of the best known artists of the 19th and 20th century whose works hang in museums all over the world. An artist’s palette is a thin board or slab on which an artist lays and mixes colors, and Schaller’s 4’ by 6’ oversized photos attest to his skill in blowing up a photo without distorting the object and his successful quest to discover samples of palettes owned by artists whose style and fame is uncontested: Picasso and Degas, Frida Kahlo and Kandinsky, Cézanne and Seurat, Mondrian and Matisse among others. But, in the Berman Museum exhibit, each photograph seems like a work of art in itself not to mention a challenge to imagine which work of art may have emerged from that particular palette or to discern ways in which the palette matches the general style of a known artist. To that end, the palette that most closely resembles its artist’s work is that of Paul Klee. His palette is a microcosm of his actual canvases as the dabs of paint are laid out in tiny squares in the manner of any number of his paintings. The frenetic streaks of color on a palette used by Vincent Van Gogh match the wavering strokes of his wheat fields and the dance of his wind-blown cypresses, his irises and starry skies. There is no mistaking this palette. Similarly, the palette of Edouard Manet, the only Impressionist-era artist to masterfully use the color black that he learned from studying Goya and Velasquez, is streaked with black strokes of varying intensities. Cy Twombly’s palette is as undisciplined as his rendition of The Iliad at the Philadelphia Museum of Art. Most surprising among the palettes is one that strangely belies its owner. Soft clouds of orange and a gentle dot of a luminous, moonglow blue make a lovely peaceful statement on the palette of the artist Francis Bacon in stark contrast to his raw often brutal paintings. The Muriel and Philip Berman Museum at Ursinus College, renowned for the many outdoor sculptures on campus, 610 E. Main Street Collegeville, PA 19426 is open Tuesday through Sunday 11 am to 4 pm.